There's a new game at Slotland today and they'll give you an up to $22 freebie to try it. There's also a choice of introductory deposit bonuses available, some with lower wagering requirements. The mystical Gypsy Charm is a fortune teller themed game with two magical bonus features. It was originally developed for their sister site, WinADay Casino. 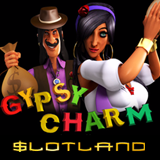 Gypsy Charm has a Free Spins bonus and a Fortune Teller pick me bonus game that can really add to your winnings. I'm no psychic, but I foresee some big payouts on this game! Hitting both the Prophetess and Crystal Ball symbols in the middle position on reel 2 and 4 starts five free spins. During free spins, one reel is all Wilds, increasing chances of a winning combination. The Wild reel moves from right to left to further improve the odds of winning. The Fortune Teller bonus game starts when the Fortune Teller and Tarot symbols appear in the middle position on reel 2 and 4. Players are then dealt 16 Tarot cards from which they pick to win up to 15X win multipliers and bonus coins. On Gypsy Charm you set the value of the coins they bet ($.05 to $1 each) and the number of lines to bet on (up to 25). You can bet as little as $0.25 per spin or place a max bet of $125. Place a max bet and spin five Gypsy Dancer symbols and you'll win Slotland’s site-wide progressive jackpot, currently nearly $230,000. New fortune teller-themed game has two bonus features. At least one previous deposit required; 17x wagering requirement. Valid for Gypsy Charm only. 17X wagering requirement; valid for Gypsy Charm only. Valid in mobile casino only; 12x wagering requirement. Valid for slots and progressive jackpot games only. 10X wagering requirement; may be used twice a day. 10X wagering requirement. Can be claimed up to 3X per day and may be used for any games. All bonuses are valid February 24 – 28, 2017 only. Next month Slotland will import another popular game from WinADay. The Leprechaun Luck slot will arrive in time for St. Patrick’s Day. Slotland, which celebrated its 18th birthday last year, was one of the very first online casinos to offer real money slot games. They now have 47 slots and casino games, most compatible with smartphones and tablets.